Gary Thompson. Pic by Pacemaker. 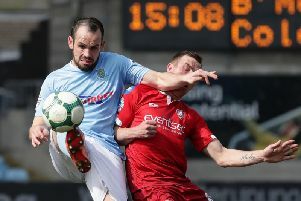 Crusaders have signed Ballymena United midfielder Gary Thompson on a three-year deal. And Ballymena United manager David Jeffrey says he is disappointed the midfielder has left the club. “Gary kept us informed throughout and has just spoken to me to confirm that he has agreed and signed a three year contract.